For years men have been naming their exes in songs, see Frankie Valli and the Four Season’s ‘Sherry’, ‘Roxanne’ by The Police, ‘Sweet Caroline’ by Neil Diamond, ‘Dear Prudence’ by The Beatles or ‘Hey There Delilah’ by the Plain White T’s – since there has been music, there have been guys naming the object of their affection in their music. In 2018, the King of Naming Exes, who I have just crowned, is Drake, who raps about an astonishing 129 separate women, most of which he name drops. All of this is well and good, these songs are great and rightly beloved, however, the problem lies in that women have not historically been given the luxury to sing about their exes as freely as men are able to. Women who sing about their exes, let alone name them, are berated for ‘moving on too quickly’, seen as ‘promiscuous’, or labelled as a ‘man-eater’. It’s okay for men to sing about their exes, but not okay for women. There have, of course, been women who have pushed societal expectation and name-dropped their exes in songs. There is ‘Jesse’ by Carly Simon, ‘Goodbye Earl’ by the Dixie Chicks, Nicki Minaj in a plethora of her songs, and Taylor Swift on ‘Dear John’ and ‘Teardrops On My Guitar’. However, each of these artists has faced backlash over this. People don’t like women owning their own story and experiences. Within four lines of the song, Grande has already referred to four of her ex’s by name. ‘thank u, next’ is a bold move, and, if history is anything to go by, should have been critically torn to shreds. It is without a doubt that, should the song have been released even 5 years ago, Grande would have been berated by the media as being a serial dater. Today, however, in 2018, she has been celebrated for her strength, tenacity and determination to take back ownership of her life. The song is Grande’s attempt at acknowledging and taking control of her own narrative, and it has not only worked but been almost unanimously praised. Grande is not the first female pop star to try and reclaim control through addressing and taking ownership of her past relationships. In 2014, Taylor Swift released the hit ‘Blank Space’, where she poked fun at the media’s perception of her as a serial dater. In the song, she adopts the persona of the woman the media has portrayed her to be, however, unlike Grande, Swift refuses to name drop. “I have a really strict personal policy where I never name names”, Swift said in an interview in 2014, “Anybody saying that a song is about a specific person is purely speculating”. A female artist who does name drop an ex on a track is Minaj on ‘Barbie Dreams’. ‘Barbie Dreams’ is a tongue-in-cheek song. Minaj not only mentions about her ex, Meek Mill, rapping “Meek still be in my DMs, I be having to duck him”, but she also name drops over 20 other male rappers, some of which are rumoured to be her exes. Like Swift and the other women who have name dropped exes on songs, For this, Minaj, as expected, faced a critical backlash. So why has the response to ‘thank u, next’ been different? Because ‘thank u, next’ is not actually about Grande’s exes. It’s about her journey to self-love and her gratitude for every experience, good or bad, in her life. Grande literally thanks each of her exes for teaching her love, patience and pain. In other instances when singers have named exes in songs, it’s often been in a naming-and-shaming capacity, as in Minaj’s ‘Barbie Dreams’. 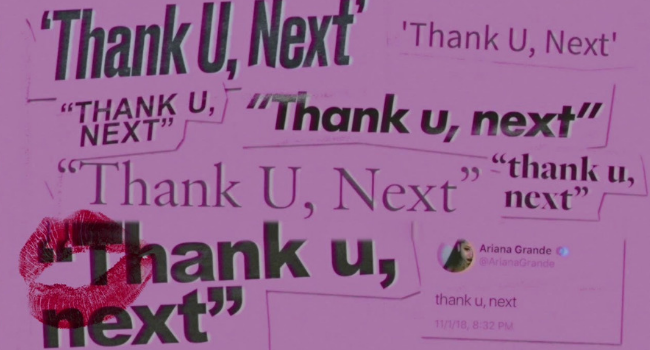 The overwhelming success of ‘thank u, next’ marks a new era in pop music where not only self-love and gratitude are celebrated, but women are able to name drop their exes in songs without judgement and criticism from the media. I for one am excited to hear more hits like ‘thank u, next’. When women tap into their power, magic happens. Drake’s ‘Boy Meets World Tour’ Heats Up!